Yes, folks, it's 9/02/10, so all the fans of Beverly Hills, 90210 are celebrating 90210 Day. I can't think of a better day to celebrate. I've seen every episode many times, I'm almost 41 years old and still have a mad crush on Dylan McKay (and a girl crush on Valerie Malone, what? She's hot!) I still think that Steve Sanders is the "original TV douche" after which all others were modeled yet pale in comparison. It's one of my favorite shows of all time, just slightly edged out of the top spot by Star Trek: The Next Generation. Gawker TV has clips of their top 9 favorite moments. My favorite of all time made the list. That would be the prom/graduation two-parter, most popularly know as "Donna Martin Graduates!" A few of my other faves are missing like The Color Me Badd (Donna Martin's mother is a dirty cheater) episode, Kelly joining the cult and Dylan saving David from the DEA. 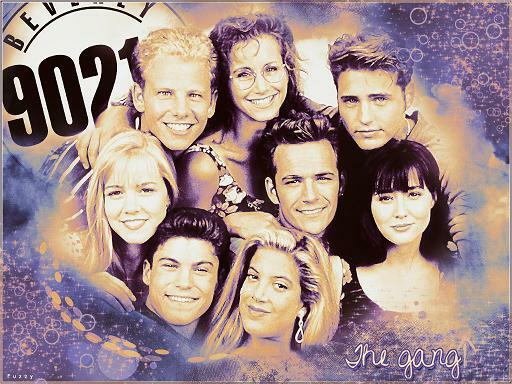 Were you a fan of 90201? Who was your favorite character, favorite episode? Will you be tuning in to the Labor of Love marathon on Monday? I know I will, for at least a few episodes. Somewhere, a few miles from here, my husband just shivered with dread but has yet to find out why. Love it!! Thank you for bringing this to my attention! I so need a little Dylan time! And seriously, is it really fair that Jenny Garth looks exactly the same how many years later?!?! Good for her! And how fair is it that Jenny Garth looks exactly the same so many years later?!?! Good for her(I liked Kelli)! I was a huge 90210 fan back in the day. I've never seen an episode of the new version though because it can't possibly compare. I had many fantasies about Dylan McKay. Happy belated 90210 Day! Oh, so sorry I am late on this post. All I have to add is "Donna Martin Graduates!"